Oct. 29, 2017 12:50 p.m.
A man survived a skydiving accident at the Salmon Arm Airport on Sunday afternoon. In a message to the Observer, Rick Scott, from Skydive Salmon Arm confirmed the incident and says the man involved was taken to hospital in Kelowna but is expected to make a full recovery. At approximately 12:30 p.m., Oct. 29, BC Ambulance was called out and a medical airlift was requested for an incident involving a skydiver. An Observer reporter on the scene witnessed one patient being transported by ambulance from the south end of the airport to the terminal building, where the air ambulance helicopter was waiting. The helicopter took off heading south towards Kelowna. Scott says he is thankful for the community’s concern over the incident. On Sunday evening, Scott spoke to the injured man, who has more than 700 jumps under his belt, and was told he will be having surgery on Monday. Scott says skydivers occasionally do have to deploy their reserve chute and most land safely but, in this case, the man’s reserve chute became partially tangled with the main parachute. The reserve chute slowed the man’s fall, but it was still a hard enough landing to cause the broken pelvis. While saying he did not want to downplay the incident, Scott says skydiving is a highly regulated sport with an emphasis on training and safety for participants. Staff Sgt. Scott West of the Salmon Arm RCMP says the incident was reported to them and police do not believe this is a criminal event. 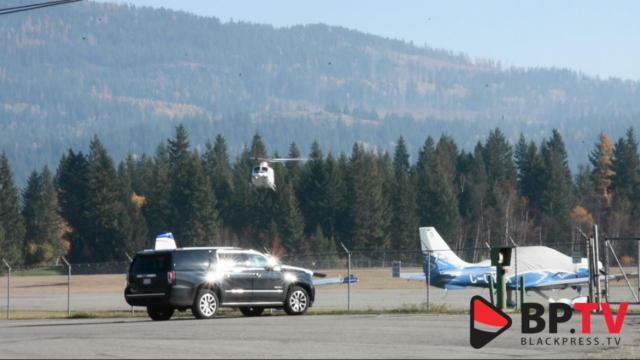 This incident took place on what was scheduled to be SkyDive Salmon Arm’s last day this season’s operation, which generally runs from April until the end of October. “Don’t you know it – it was the last jump of the last day of the season,” Scott says.